I would have missed the IFC Studio Ghibli retrospective in my New York visit if omo hadn’t invited me to join him and his friends to tonight’s showing of Porco Rosso, and for that I thank him—because it gives me a chance to talk about one of Hayao Miyazaki’s most unique films and why it still stands the test of time nearly 20 years since its release in 1992. “Porco Rosso”—”The Crimson Pig”—is a man-turned-pig flying ace who, after seeing combat in the Italian Air Force during WWI, leads the life of a solitary bounty hunter going after various air pirates. A new American hotshot pilot, Curtis, challenges his supremacy in both the air and in love with the beautiful club owner Gina. When Porco’s plane goes down, a bright female mechanic named Fio and the rest of her family help rebuild it and become involved in the ultimate showdown between the two pilots. 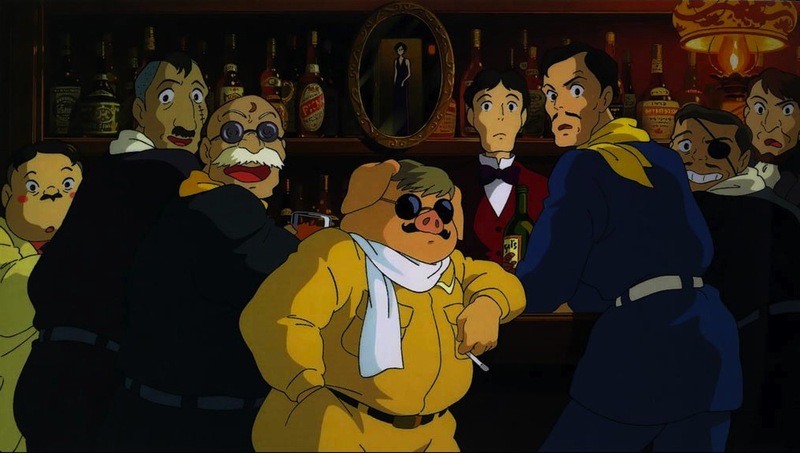 Porco Rosso is perhaps one of the more overlooked titles in Hayao Miyazaki’s catalogue. Its release fell between Kiki’s Delivery Service (1989) and the international breakout hit Princess Mononoke (1997). Mononoke represented a shift in Miyazaki’s direction toward a somewhat darker and surreal approach, making the comparatively carefree Porco Rosso the last of its kind until the child-like Ponyo came out a few years ago. It also marked a number of firsts for a Miyazaki film. It is one of his only films with a male, rather than female protagonist. (The females present are plenty strong and capable, however.) Despite the title character’s porcine nature, it is also his least “fantastic” film—it is grounded in a real historical time period and place and aside from Porco has no spirits, creatures, Totoros, and invented nations. The amount of care and detail given to the airplanes and the dogfights testifies to Miyazaki’s lifelong love of flight; this is perhaps his purest love letter to flying in his career, capturing its freedom, adventure, and excitement like no other. There is plenty of flying of various kinds in all his movies, but only Porco Rosso is about flying itself. That focus, and the film’s sun-dappled Mediterranean/Adriatic Sea setting, are what make the film feel so joyous. This is true even though there are many understated, but finely depicted, elements of adult emotion throughout: grief over the war dead, regret, and the grizzled weariness borne from life experience. Porco and Gina are adults, not teenagers like most modern anime protagonists, and they’ve lived through a lot. The adolescent in the cast, Fio, seems almost ridiculously naive as if compensating for it; she is pure Ghibli girlhood distilled: optimistic, competent, and confident and brave in front of men who otherwise look down on her, including slightly sexist Porco himself. (He is a pig, after all!) 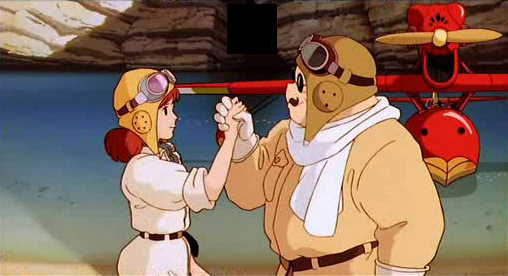 With the comical air pirates in tow, reminiscent of the pirates in Laputa: Castle in the Sky, the cast is well-balanced and with relatively little exposition drawn vividly. An old war buddy tries to recruit Porco into the Fascist Air Force. 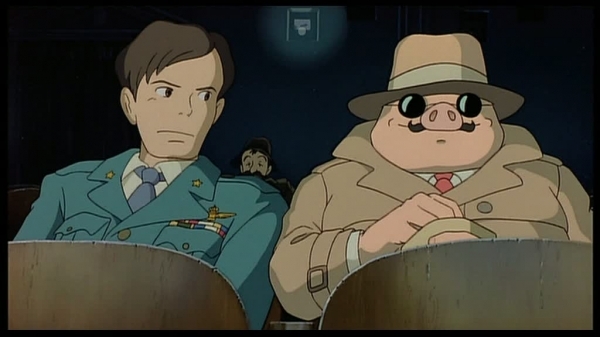 One thing that is interesting is that for a film set in 1930s Fascist Italy, Porco Rosso seems to keep much of the darkness of the outside world confined to the edges of the narrative. There’s evidence of it, to be sure: we see the Fascists march down the street, and later, there is a chase and a shootout with the secret police. The arrival of the Italian Air Force signals the end of the party, and there is more than one mention of the ongoing Depression. But the characters seem to live in a bubble where few of those things impinge on the jaunty, carefree mood of the loose plot. Kidnapping seems fun for the kids. No one really gets hurt. There is enough personal regret to go around to help make up for it, though: again, it is refreshing to see real adult emotion in anime today. The scene with the queue of fallen pilots and their planes was particularly moving and free of melodrama, something most anime drama can only dream about achieving. Still, no one in the named cast, not the pirates, or Curtis, has malevolent motives; they’re all basically good people. A deeper examination reveals nostalgia for the age of freelance flying aces and even air pirates, an age that the impending wars would end for good. In a totalitarian world, there is no room for people like Porco in the long run, and in one clever line Porco declares “I’d rather be a pig than a Fascist.” Perhaps since everyone knows just how dark the world would become in the years forward, there was a need to lighten the tone and make the world of aces and pirates a bit more romantic by comparison. But this isn’t really a problem. In a way it helps make the film feel more timeless, and it’s hard to see how darkening the mood would have really added depth to the story. The likability of the characters, Joe Hisaishi’s bouncy score, and the sheer delight evident in the flying scenes leaves the viewer feeling refreshed and satisfied by the end. There is some sadness in realizing that not even Miyazaki makes ’em like he used to anymore, but that makes this film all the more special. Porco Rosso has been available on home video through Disney for a while now in the US. This review was based on a renewed 35mm print shown at the IFC Ghibli Retrospective, which continues until January 12. I highly recommend anyone in the New York area to see it and the other Ghibli masterpieces in these clean, nearly pristine prints: the hand-drawn quality of the film stands out so well and more than holds up in our cel-less age. I don’t really have anything to add – you hit it on the head. This is Miyazaki’s most subtle film, I think, and that’s a great deal of its appeal. After reading your review, I have to watch this again. I forgot a lot about it, unaware of Mussolini Italy and historical background, and I didn’t have enough faculty to understand the adult world at that time. Yes, probably this may be the only film of his that is not kid-oriented and based on realism. So, you’re in NYC! NYC is cool for a lot of things are going on!